My Pillow Pets are snuggly toys that mix the security of a child's favorite stuffed animal with the practicality of a pillow. Since they were first introduced, the My Pillow Pets line has grown to include a huge selection of animal pillows, pillows based on kids' favorite characters and even miniature Pillow Pets and blankets. Soft, cuddly Pillow Pets work well for naptime, bedtime and even long trips in the car. Initially, there were only six styles and one size from which to choose. However, popular demand called for more designs and styles of Pillow Pets. Traditional styles range in price from $19.99 to $29.99, with special character and sports styles often being priced higher than traditional animal Pillow Pets. Ms. Lady Bug, a bright red pillow with black spots and a cute face featuring a smile and a red nose with black dots. Huggable Hippo, a light purple hippo with a big smile on its face. Bumbly Bee, an adorable black and yellow bee with yellow wings and cute red nose. Zippity Zebra, a traditional black and white zebra with pink accents on the belly and inside the ears. Friendly Frog, a basic green frog with cute buggy eyes. Pillow Pets have also been designed to represent some of kids' favorite Disney and Nickelodeon characters. Nickelodeon characters include Shrek, SpongeBob and Dora the Explorer. Disney characters include Mickey Mouse and Minnie Mouse, Simba from The Lion King, Winnie the Pooh and friends, characters from the movie Cars and more. In addition to the regular Pillow Pets, the My Pillow Pets brand has expanded to include different sizes, blankets and other fun items. PeeWee Pillow Pets are 11 inches instead of the regular 18 inches. Most regular-sized animals also come in the smaller size. This smaller Pillow Pet is ideal for kids who want to take their pets with them on car trips, to daycare or just like to carry them around outside of the house because they are easier to manage than their larger versions. Jumboz Pillow Pets are giant Pillow Pets, made to be 30 inches instead of the regular 18 inches. Only a few of the regular Pillow Pets are also made in the Jumboz size. They include the zebra, puppy, panda, lady bug, giraffe, leopard, moose and rainbow unicorn. Over 20 of the Pillow Pets animals also come in blanket form. Pillow Pets Blankets feature the same cuddly chenille fabric as traditional Pillow Pets. The animal's head serves as a pillow and is attached to a three foot by four foot blanket. Dream Lites are the newest addition to the Pillow Pets family. These cuddly creatures look like traditional Pillow Pets, but instead of turning into a pillow, they have lights on their backs. When turned on, the Dream Lites project images on the ceiling, helping children get over their fear of the dark. Included in the Dream Lites collection are 12 of the traditional Pillow Pets animals including the rainbow unicorn, hot pink lady bug, snuggly puppy and playful penguin. While you will find Pillow Pets at nearly every pharmacy, discount store and toy store, not every product that resembles a Pillow Pet will be from the My Pillow Pets brand. 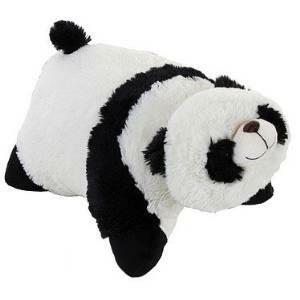 Multiple other companies have capitalized on the brand by creating knock-off versions of these popular stuffed animals. Knock-offs may not last as long as traditional Pillow Pets or feature the same soft, chenille fabric. Authentic items will have a My Pillow Pets tag sewn into the pillow. All Pillow Pets and related products are approved for use by children ages 3 and up. Under age three children may play with Pillow Pets, but should not sleep with them because, like all pillows, they pose a suffocation risk. Every once in a while, your child's Pillow Pet will need to be cleaned. Place the stuffed toy inside of a clean white pillowcase and tie the open end. Wash in cold water on a gentle cycle and let air dry. Do not put your Pillow Pet in the dryer and be sure to never use bleach. From being named a top toy by Oprah to making the Toys 'R Us Hot Toy List, Pillow Pets have continued to gain popularity. Their friendly faces and soft fabric make them popular with kids. Their versatility makes them loved by parents. While it may seem silly to spend $20 or more for a pillow, it may be worth it for something your child will grow to love.